A question often arises about just how Metropass riders use their passes. How many trips do they really take? How much of a “deal” are they getting compared to those who pay by tokens, tickets and cash? The TTC conducts a rolling survey of passholders on a weekly basis with about 30 riders who keep track of where they travelled. It is a new group every week, and so over the course of a year, the TTC will have about 1,500 separate surveys. The information recorded by riders is converted back into a trip count (allowing for “normal” TTC transfer rules) to arrive at a trips/week value for each person surveyed. 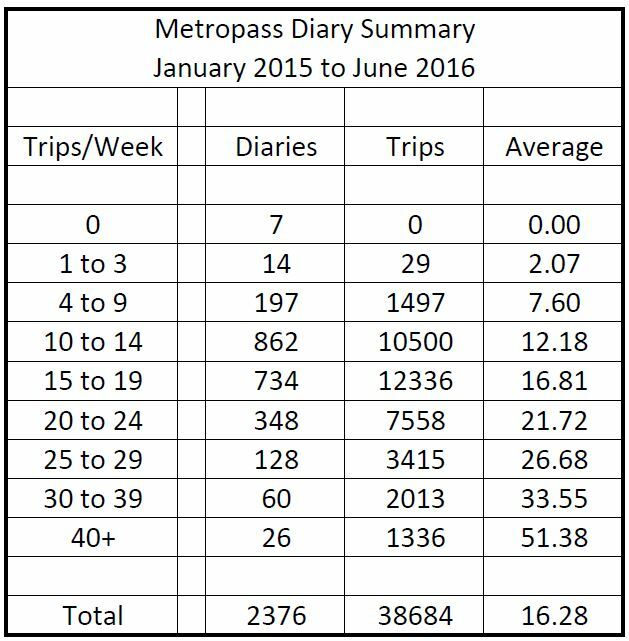 With a small sample set, the values bounce around a lot, but aggregated over time, they can give an idea of what Metropass usage actually looks like. The data is used to calibrate the conversion factor from pass sales to “rides” in the TTC’s regular reports of “ridership”. With over half of all “rides” now taken with passes, this conversion factor is important, and a small change in the multiplier used can have a big effect on the calculated ridership. 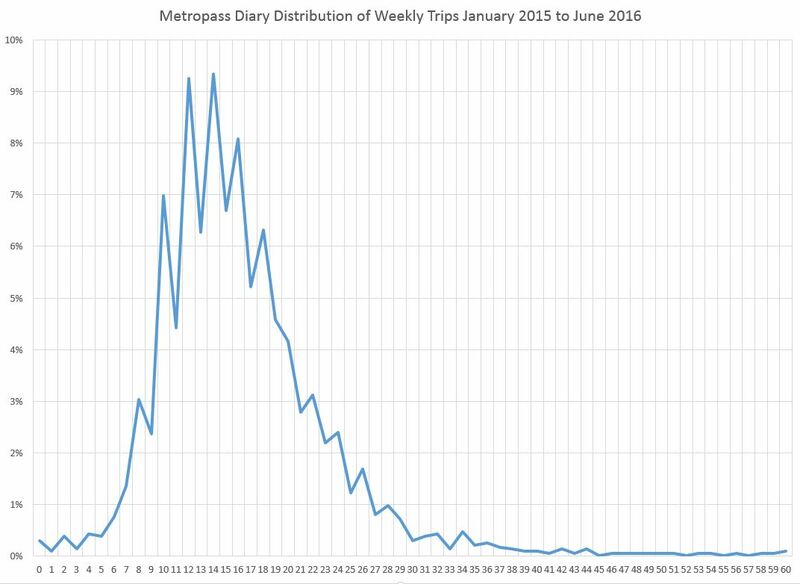 Moreover, if Metropass sales fall, the presumed “loss” of rides is at the average for the whole group even though it is more likely that the lost customers will be relatively low users of passes. Wondering about just what the numbers looked like, I asked the TTC for statistics from their weekly diary surveys spanning January 2015 to June 2016. The raw data are from the TTC, for which much thanks, but I have consolidated and reformatted them for this article. The presentations and interpretation are my own. The overall numbers for the 18 months are shown in the table below. This table groups the data by the number of trips reported in the week. About two thirds of the diaries report between 10 and 19 trips a week, and the overall average is 16.28. Note that the “trips” values shown here are actually calculated from the individual values (i.e. number of diaries times number of trips). Another way to look at this is to plot the percentage of diaries reporting individual numbers of trips.